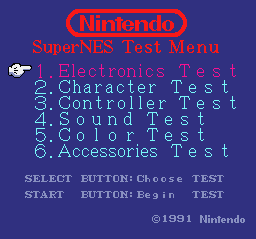 The SNES Test Program is one of around four discovered cartridges once used by Nintendo World Class Service to test and diagnose problems with the SNES and controllers (the SNES Burn-In Test Cart being another). While the main menu is dated 1991, the inclusion of functionality for the Super Scope and SNES Mouse, plus a hidden message, date this build to no earlier than July 29, 1992. Graphics for earlier builds of the test programs are left in the ROM. Nintendo reused the main code for every test cart, updating it every so often for new accessories and the like. A variation of the Choose/Begin Test text using the larger of the two fonts included in the ROM. This was probably changed when the Accessories Test option was added to the menu, as there was no more room. Since this isn't a Japanese test cart, they wouldn't use Katakana, would they? The larger font is also stored in the ROM. Only the ampersand is used by the test program. The other symbols are unused. The Version 1.02 Burn-In Test was present in an earlier version of the test cartridge, as documented here (Warning: embedded MIDI). The Burn-In Test consists of a quick hardware test, followed by graphics and color tests. These tests repeat until the console is turned off. This advertisement for the Nintendo World Class Service was displayed during the 1.02 Burn-In Test as well. Text from an earlier version of the Controller Test. Since "set" had previously been used by Nintendo as a mistranslation of "insert" for the Family Computer Disk System's "PLEASE SET DISK CARD" message, it's possible that this was an instruction to insert the controller (plug it in). These sounds may have been intended for Super Scope testing. The third sound is the second sound reversed. Easily the most interesting thing about the Test Program is that it contains graphics of an early Super Mario World, most of which match up with prerelease screens of the game. Note that not all of these graphics seem to be from the same build of Super Mario World. Individual graphics may have been updated along with the Test Program, while others were left alone. The main difference between these sprites and the final's is the palette, the version here using darker reds and blues than the final. Super Mario's graphics are largely the same, the only significant change being that his hat was redrawn slightly for the final. ...it's the same sprite used in an early (1989) build with the mushroom-shaped map. A different version of the standard brick, based on the Super Mario Bros. 3 brick. An early version of the stone block, based on the Super Mario Bros. 3 fortress blocks. Also based on the respective Super Mario Bros. 3 graphics. Originally, there were objects in the game that gave you coin bonuses. These are still coded in the final (you can get 5, 10, 15, 20, and 25-coin bonuses), but the graphics were removed and the only way to get them without hacking is by bouncing repeatedly on "calm" Wigglers as Mario alone. An early Fire Flower, again based on the Super Mario Bros. 3 graphic, with an erroneous green pixel on the flower. This version can be seen in pre-release screens. 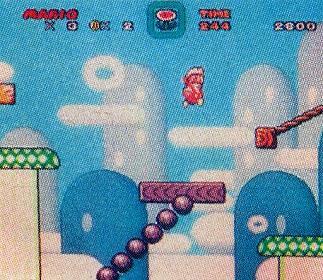 At one point, the Goombas of Super Mario World would have been squished when jumped on, like in previous Mario games. 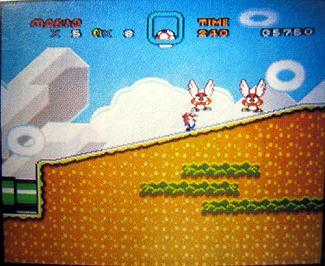 Early screenshots of the game showed that Goombas more resembled their Super Mario Bros. 3 forms, so the idea to keep them squishable was around long enough to survive the redesign. Raccoon Mario was set to return in Super Mario World before being replaced by Cape Mario. Two sprites of Raccoon Mario. One is clearly the end-of-level victory pose, but the other is not so certain: it appears to be Mario spinning his tail, although it is more likely to be one of the frames used when punching the flipping nets. This is another element that was present in the early screenshots of Super Mario World. 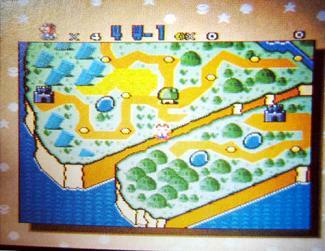 A version of the circular spinning platform seen in Yoshi's Island 3 and other places, with graphics from Super Mario Bros. 3. It can be seen in the Fire Flower picture above. Another Super Mario Bros. 3 remnant, the Venus Fire Trap was completely left out of Super Mario World with no hint of it ever existing, unlike the Piranha Plant. Strangely, its open-mouthed graphic doesn't fit very well atop the stem, hinting that it was something slightly different than in Super Mario Bros. 3. A tiny P-Switch. Based on its appearance and placement in the graphics, it was likely used as a placeholder for tiles that change after a P-Switch is pressed. A minor difference in shading. The old block has some additional, darker shading on the right side, two pixels of which remain in the final. Again, a minor difference in shading, in this case near the top of the grass. The palette is also brighter than in the final. 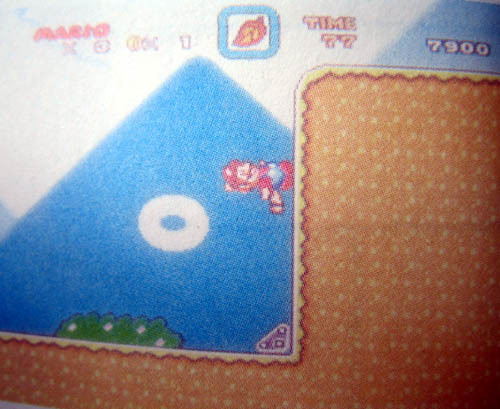 While this style is used for all the ground graphics in the Test Program, in Super Mario World only the two top tiles that make up the ground in Yoshi's House were kept. The final pipe lids have a more rounded appearance, while in the Test Program they're more angular. The actual pipes are also wider in the final. The same transformation is present in the horizontal pipes. It's possible that the graphics that appear where the rubble would be in the Test Program weren't used for the same purpose, but it looks similar enough. The final's dust cloud is a lot more interesting than that of the Test Program, which is based on the Super Mario Bros. 3 style. A slight change in shading. That's all. This starts the trend of a loss of asymmetry. In the Test Program, the topmost 16×16 part of the Bill Blaster uses four unique 8×8 tiles; in the final, this was reduced to two, with the left half being flipped and reused as the right half as well as being reshaded. This change proved to be completely unnecessary, as the spare tiles were not actually used for anything. In fact, the lower-right tile of the top is still present in the graphics, but unused. The asymmetry of the first coin frame was kept for the final, but the second and third frames are stored in VRAM as single 8×8 tiles that get flipped vertically to make the whole coin. Another shading difference related to the way the graphic is stored: while it's stored as-is in the Test Program, the final stores it as a single 8×8 tile. The trampoline lost the most by the final: the first two frames went from being stored as one 16×16 tile to being stored as one 8×8 tile that is repeated and flipped horizontally and vertically to make a 16×16 sprite. For whatever reason, only the first two frames were reshaded. This message by Khanh Le, the programmer of the mouse test, is present in the ROM. It also helps to date this particular build. 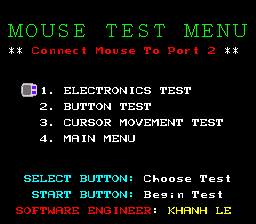 Also, holding L + R on the Mouse Test main menu will bring up "SOFTWARE ENGINEER: KHANH LE". This page was last modified on 12 March 2019, at 12:25.